The Hilliste Formation (Lower Silurian, Llandovery series and Rhuddanian stage) is well exposed in a quarry in western Estonia. During the deposition of this unit, Estonia was part of the paleocontinent Baltica, which was located near the equator. The Hilliste Formation thus records the recovery of tropical invertebrate marine communities following the mass extinction at the end of the Ordovician. Globally, pre-extinction levels of marine diversity were not met until the Wenlock, about 15 million years after the end of the Ordovician; this formation was deposited about three million years following the event. The Hilliste Formation contains a diverse fauna including brachiopods (orthids, atrypids, rhynchonellids, pentamerids, and strophomenids), corals (favositids, halysitids, heliolitids and rugosans), stromatoporoids, bryozoans, gastropods, crinoids, ostracodes and trilobites. 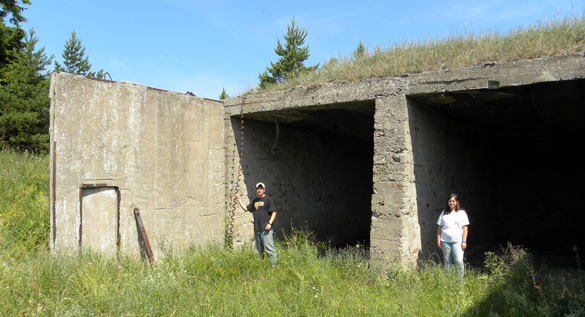 We measured, described and sampled the Hilliste Formation at Hilliste Quarry on Hiiumaa Island, western Estonia. The unit records a regression from depths between normal and storm wavebase to depths at or above normal wavebase. The evidence for this paleoenvironmental interpretation includes more argillaceous beds in the bottom two-thirds of the formation and more biosparite/grainstone upwards. 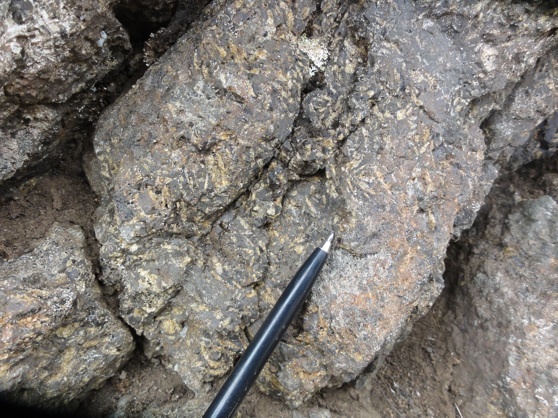 The top third of the formation consists of massive biosparite/grainstone with little clay and overturned and fragmented corals and stromatoporoids indicating high depositional energy. 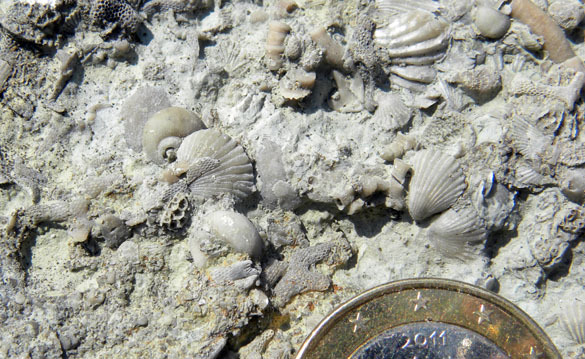 The fauna changes stratigraphically upwards from one dominated by brachiopods and gastropods to a community primarily of corals, stromatoporoids and crinoids. This fauna provides additional information about biotic recovery in eastern Baltica and its implications for the migration of Early Silurian Baltic taxa into other regions. The boundary between the Wenlock Series and the Ludlow Series can be easily observed on the island of Saaremaa in western Estonia. Here, the boundary is distinguished by a major disconformity that can be correlated to a regional regression described in several previous studies. During this time, western Saaremaa was a lagoonal facies that reflected sea-level changes within the Baltic Basin. 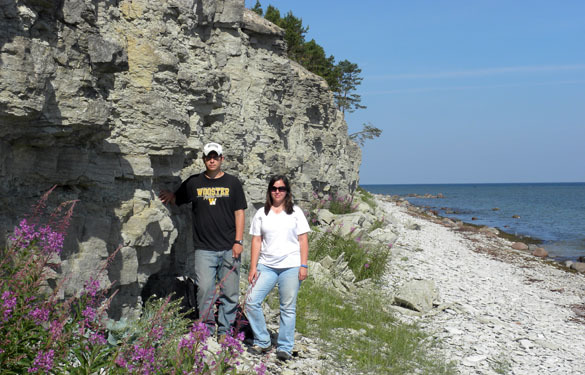 We measured and described this Wenlock-Ludlow boundary interval at Soeginina Cliff on the western shore of Saaremaa. Here this boundary consists of the Vesiku Beds of the Rootsiküla Formation (Wenlock) overlain by the Soeginina Beds of the Paadla Formation (Ludlow). The Vesiku Beds (Wenlock) record a carbonate lagoonal environment with finely laminated beds and Thalassinoides burrows (indicating oxygenated bottom conditions). The fauna is much less diverse than that in normal marine sediments of the Wenlock. The top surface of these beds (the primary discontinuity surface) shows a microtopography and dissolution consistent with exposure and abrasion. 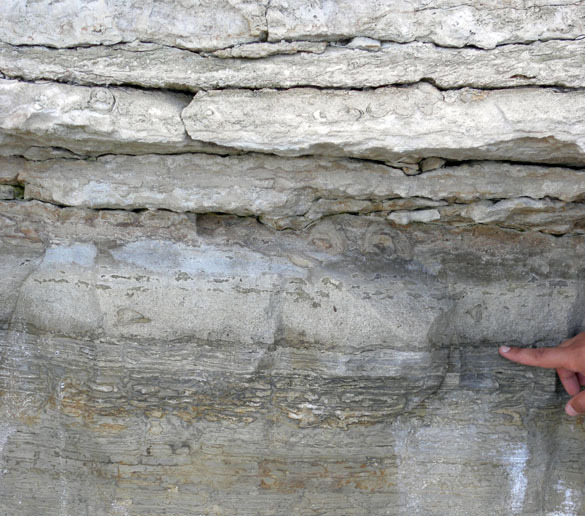 The top 20 centimeters also show diagenetic alteration of the laminated sediments, probably from fluids traveling through the Thalassinoides burrow systems. The Soeginina Beds (Ludlow) show pulsating transgressive sediments with multiple discontinuity surfaces. Large oncoids are common in these beds. They have distinctive shapes because they were initially spherical and later stabilized and grew like small stromatolites upwards. These forms may indicate periodic energy reductions in these transgressive waters. There are also storm beds with biogenic debris including oncoids nucleated on gastropods. This boundary interval is topped by thin dolomites and stromatolites. This example of the Wenlock-Ludlow boundary can be correlated with other such disconformities recorded in a variety of depositional environments, such as in the equivalent reef complexes of Gotland, Sweden. KURESSAARE, ESTONIA–When I was growing up the Soviet Union was simply an unchangeable fact of life. The United States had an implacable enemy, and we were locked in a struggle that would last my lifetime, at least. That lifetime was almost certainly going to be short, of course, because sooner or later someone would push the nuclear button and, in the words of the Kingston Trio, “… we will all be blown away”. Thus it is very much an existential treat to have lived into my sixth decade and be able to walk through the remains of a secret Soviet missile base to get to the Suuriku Cliff locality this morning. 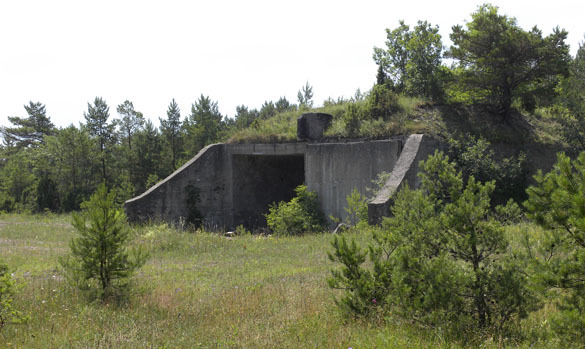 The Evil Empire collapsed, the Baltic States were liberated, and massive overgrown concrete bunkers stand as evidence of a nearly unimaginable past only 20 years old. I am privileged as a geologist to be able to travel to such places and feel the turning points of history. 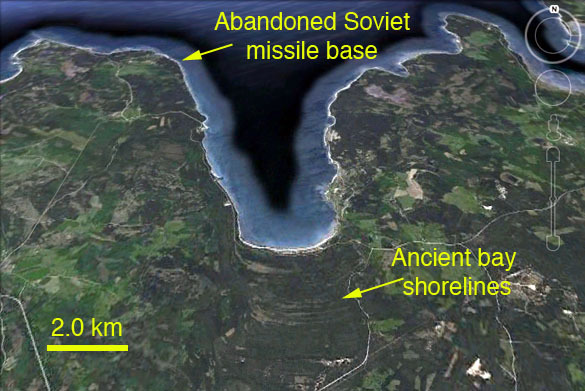 While constructing this Google Earth image of Tagalaht Bay to show the location of this Soviet base (one of dozens on the island, by the way), I saw something cool in the south: ancient shorelines. Saaremaa, like most of the Baltic region, is experiencing post-glacial isostatic rebound. The land is rising at least 2 mm per year (and in some places much more), so the sea is retreating. These shorelines are only a few thousand years old. KURESSAARE, ESTONIA–Today we visited one of Rob McConnell’s (’10) Senior Independent Study field sites on the northwest coast of Saaremaa. Suuriku Cliff (N58.50875°, E21.99818°; see above image) is an exposure of the Jaani Formation (Lower Silurian, Wenlock). There are two members here: the upper Ninase (most of the cliff) and the lower Mustjala. 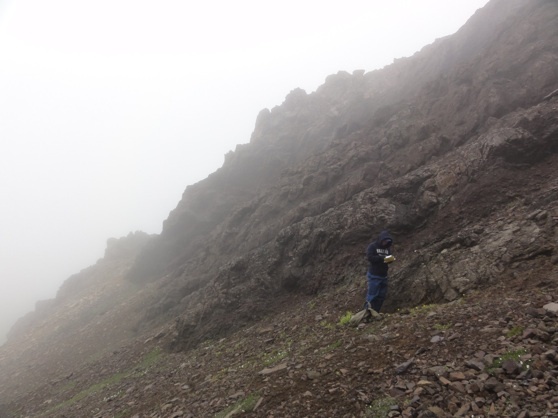 Rob sorted out the paleoecology and environments of deposition of these two members using samples from this location and two others. 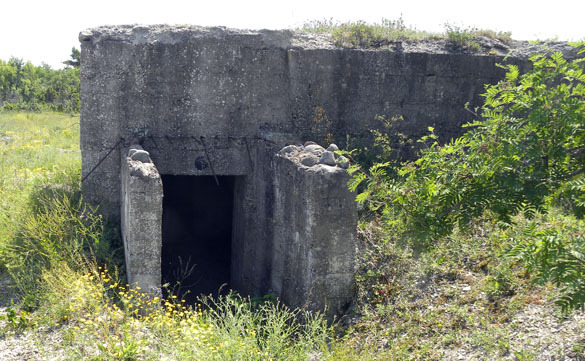 We were here today to find additional crinoid calices to continue a project Bill Ausich, Olev Vinn and I are pursuing. We found a few, too, although none very photogenic. It was also a chance for us to see more examples of Silurian limestone and fossils before we leave the island on Saturday. Nick Fedorchuk and Rachel Matt at Suuriku Cliff. We want to show that some Saaremaa cliffs really are more than a meter high! Panorama of Tagalaht Bay south of Suuriku Cliff near Veere. This bay is where German naval and infantry forces invaded Saaremaa on October 11, 1917, in Operation Albion. 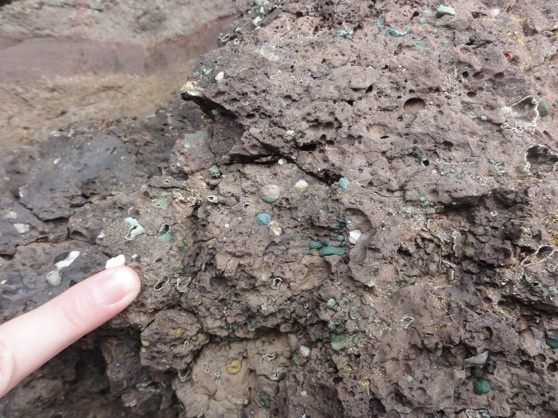 As we climbed higher, we continued to see zeolites in a variety of sizes. Travis’s tip to me was to look for the white zeolites, as these are more diagnostic of their environment of formation (temperature). It was important to keep track of the units we were climbing up through, as boundaries between flows were frequent. 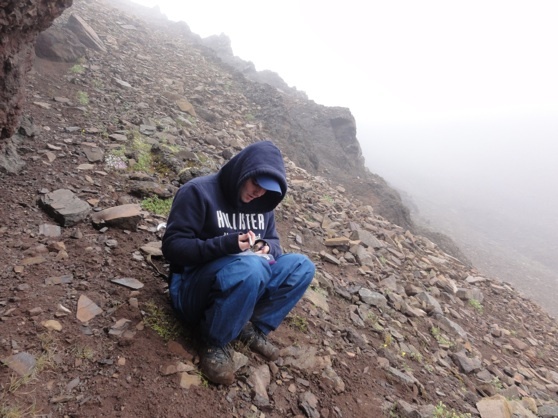 Travis perches on a slope to take notes, notice the fog in the background! 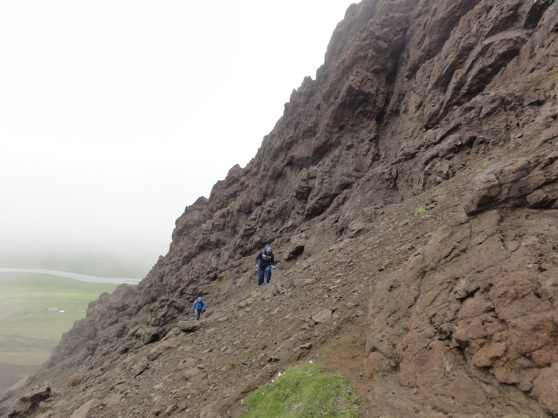 Unfortunately, this has given me more time to dread this afternoon’s hike-Travis and I are pretty sure that Vatnsdalsfjall literally translates to “Death Mountain” in english as this is the steepest thing he or I have ever hiked. Not only is it steep, the loose apple to watermelon-sized talus makes every step treacherous; I bit it a couple of times and I have the bruises to show for it! I know our Alaskan colleagues probably have no sympathy as it sounds like their hiking was rigorous as well! However, the successful sampling we completed yesterday as well as the panoramic views of the valley below over PB&J at lunchtime make it well worth it.